When I was ten or eleven, I discovered to my horror that a couple of my classmates (Iron Maiden fans who drew devils on their copybooks) didn’t believe in God. I knew they must be wrong, because without God, how could life have any meaning? And if it had no meaning, what would be the point in continuing to live? But by my late teens, I found my own faith waning, and suddenly that question became crucially real to me. The existentialist philosophy with which Camus was often associated, concerned itself in part with the irreconcilable conflict between our natural, inevitable demand for a meaning to life, and the universe’s equally inevitable silence to that demand. However convinced we are that there must be a reason for us to be here, there is – beyond our own human constructs of religion – no such reason to be found. This unsolvable double-bind is what existentialists call the absurd, and it may at first seem to lead to despair and nihilism. But not for Camus. It is because of how he confronts this “one truly serious philosophical problem” that I say his words and thoughts changed my life for good and for the good. He rejected his existentialist label, in part because what he concluded from the absurd was very different from the traditional existentialist conclusion. For Jean-Paul Sartre and other existentialists, the absurd was an end: the world was reducible to nothing, human life and existence once analysed were meaningless, and that was the end of the story – an end that itself embodied this very absurdity. For Camus, however, life begins – not ends – with absurdity. To live one’s life in spite of its inherent meaninglessness constituted a revolt against the absurd, and emphasised the highest quality of the human individual. In this, he destroyed the assumption that life’s inherent worth was dependent on life’s inherent meaning. In that revolt, we create our own meaning, and so overcome the despair and angst that might otherwise result from the absurd. He writes: “The true greatness of man is to fight against that which is greater than he”. If there is a sin against life, it consists perhaps not so much in despairing of life as… in eluding the implacable grandeur of this life. In my Existentialism class at college, we barely touched on Camus. He denied he was an existentialist, others denied he was a true philosopher, since his thought was subjective and emotive, not objective and logical. Still, I chose to write my thesis on him because I felt more profoundly affected – subjectively and emotively – by his writing than by anything else in my course. (Also, I was perhaps drawn to a thinker who elucidated his thought not in dry academic texts, but artistically and aesthetically in novels and plays.) His may not have been philosophy in the academic sense, but it was a philosophy, a personal ethic by which to live. What I found in Camus was what I had been looking for when I chose to study philosophy – that it would be a guide to life and how to live it authentically. Camus offered me that, and – often in the face of fierce criticism – he exemplified it himself: philosophically, artistically, politically and personally. At the moment of his execution in The Outsider, the anti-hero Meursault “felt ready to start life over again”. But aware of that impossibility, instead “for the first time, the first, I laid my heart open to the benign indifference of the universe… I was happy still.” In January 1960, Camus decided on a whim to take a lift to Paris with his friend Michel Gallimard rather than take the train with his family. When, with his unused train ticket in his pocket, the car hit a random tree, I imagine that – had he time to do so – he too would have considered it an absurd but happy death. I’ve only read a small bit of Camus and you don’t hear much about him. I thought this post was a really good summary of his thinking. I think his positive, rebellious approach to potential lack of meaning is life affirming and it’s a worldview that should be more widely acknowledged. Thanks for your comment, Sammy. Glad you enjoyed the post, and couldn’t agree more. Thank you for sharing this. 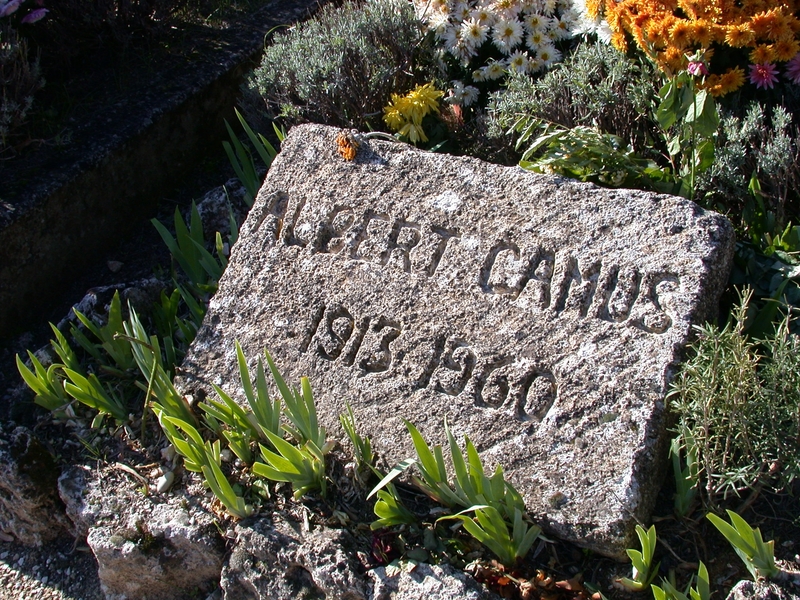 I found your site while looking for the author of “Live to the point of tears,” and was drawn into your blog on Camus. Like the other commenter, I did not know much (anything?) about him and appreciated the great review. Thanks a lot, Jeremy. Great to know I could introduce you to such a great writer. This is very good and made my day. Another Camus’ admirer here. Cheers and live to the point of tears. Thank you kindly for your comment, Isaac, and sorry for the delay in replying. Good to hear from other Camus readers. Thanks for this piece. Lovely writing. Thank you, Suzanne. Good to know you enjoyed it. Reblogged this on Ha Dao. Fantastic. I love Camus. His writing is so lucid yet full of emotion and imagery, as you said. You write well and articulate Camus’ ideas excellently, I thought. I always wondered, though, if perhaps Camus’ blatant rejection of the Existentialist label was because of his and Sartre’s falling out; while there are most definitely big differences between their philosophies, there are also huge similarities. I agree that Sartre reduces the universe to nothingness—all objective, inherent meaning goes out the window. But Sartre doesn’t stop there, does he? He doesn’t say we should wallow in Despair. True happiness is born on the other side of Despair, is (roughly) a quote my Philosophy teacher recited when we studied Sartre. It is an active Philosophy, Existentialism, one of choice and concious action and responsibility for one’s self; a kind of anti-quietism. Camus was apparently more concerned with the the Absurd (similar to Roquentin’s Nausea in Sartre’s novel, perhaps? ), and also more concerned with suicide. Which is why I love him. I agree that it is the most important question. I just don’t think Sartre was as depressing as some seem to think, and wonder if Camus’ rejection of the label was personal or really because of huge differences. In fact, reading Being and Nothingness by Jean-Paul Sartre, as dense as it is, reeeally helped me get a bit of a better handle on my emotions. Realizing that, moment to moment, I make the choice whether or not to allow emotions and outside stimuli to affect the way I behave—the emotion of sadness occurs as a possibility to our consciousness, as does the opposite possibility; WE decide to assume a lot of the gestures of sadness, perpetuate that feeling—well that was huge for me. Out of nothingness comes freedom. I find it to be a powerful tool against my depression and anxiety. Anyways, I would like to hear your thoughts on the Camus vs. Sartre’s Existentialism thing. Excellent essay on a man who has also influenced me profoundly. For years I made it an annual ritual to re-read Camus’ “Lyrical and Critical Essays,” a collection that includes the essays cited here. It’s precisely Camus’ ability to describe his “philosophy” in sensual, earthy terms, that I like best. His is what I think of as an “incarnated” intellect–the thought/idea is “incarnated” in the physical world of bodies and places and relationships. In THE PLAGUE he discusses whether someone who doesn’t believe in God can be a saint. This is exactly in keeping with what the author of this essay describes as Camus’ view that even if there is no religious “meaning”–even if there is no god/God/Creator/universal being–there is still value in living with compassion and kindness. Something else about Camus’ “philosophy” noted in this essay is that other philosophers didn’t regard him as a true philosopher because his “philosophy” was emerged from his actual life. But that is precisely how the Greek philosophers lived and philosophized as well. It wasn’t something hypothetical, but rather the wisdom that emerged from their own lives of contemplation and study. For Camus, action is also very important–more so than the mere act of thinking. Again, that is very “Greek.” The philosophy emerges from the life, rather than the life being constructed according to another’s philosophy. Found this post accidentally while looking for a Camus quote. I’ve been struggling w/ divorce and joblessness. This post was an absurd pleasure to find. Thanks for helping me through a difficult time.